Review | Should a family car be as spacious and functional as possible? Is it not a problem when the vehicle is shaped like a box and drives like a van? Or should a family car drive like a regular car but still offer tons of extra space? 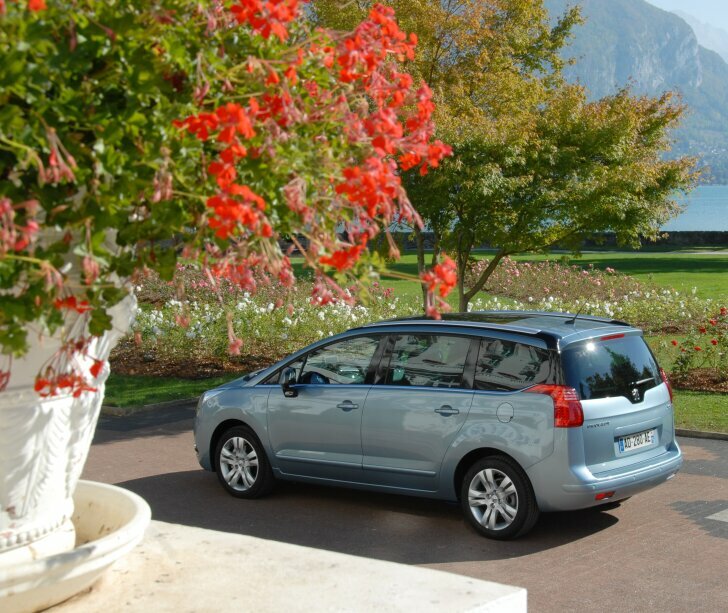 Peugeot promises the latter: all advantages of an MPV, but combined with the comfort and refinement of a normal car. Did Peugeot succeed? 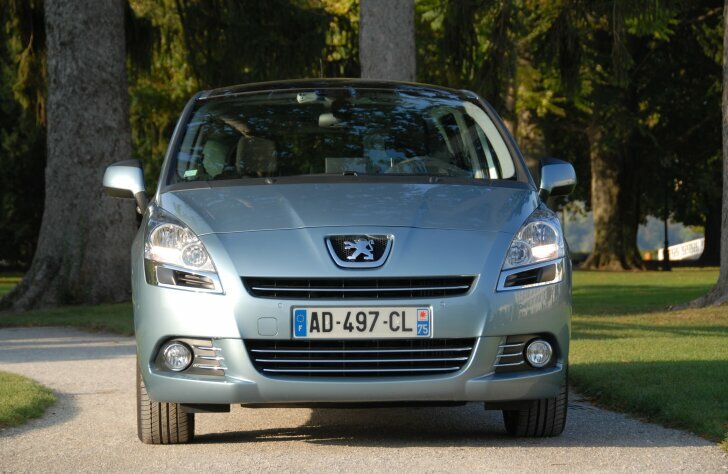 Peugeot offers a wide range of models: from the small 107 via the beautiful 308 CC to the chic 607. Even special requirements can be fulfilled with the 1007 (an odd-space wonder with sliding doors) or 4007 (an off-roader with style). But oddly enough Peugeot never offered a mid-sized family car, while these so-called "MPV's" (Multi Purpose Vehicles) are hugely popular. That is why Peugeot now revives the old "5" range; a number that has always been used for family cars. The 5008 is purposely presented as a family car, not as a van. When designing, space was the first priority while the aerodynamic appearance makes the 5008 look like a tall estate car. The slender lines and many chrome accents give the 5008 the charm and flair that is typical of a Peugeot. The 5008 is available in either a five- or seven-seater version. Both have the same wheelbase. The five-seater version offers extra storage space below the floor in the boot. The seven-seater uses that space to store two extra seats when they are not in use. The third row of seats can be pulled out of the floor in one move. The extra seats offer space to two children or very limber adults. Because the first back seat is on rails, it is possible to slide it forward and create some extra legroom on the seats in the far rear. Then these are a bit less cramped than usual for a car of this size. The side airbags are so big that they cover all three rows of seats, so even safety on the rear seats is guaranteed. The second row of seats (the regular back seat) offers plenty of head and legroom. The backrests of the front seats are fitted with airplane style, foldable tables. In the floor adjacent to the back seat, extra storage space can be found. Optionally the 5008 can be fitted with video screens in the headrests of the front seats. These have separate inputs, so one passenger can watch a film while the other plays a game. The multi-media system comes with two wireless (Bluetooth) headphones, so the entertainment in the back doesn't forego the expense of the peace and quiet in the front. As stated before, the 5008 is made to feel like a normal car. Therefore the dashboard is built around the driver and co-driver, just like with the 3008. This car certainly doesn't give the spacious feeling of the average MPV. However the 5008 does offer an MPV-like high driving position. This gives an excellent view over traffic and makes travelling long distances less tiresome for the driver. According to Peugeot, the 5008 is a new reference in build quality. Indeed the materials used look and feel good. Again this car doesn't feel like a nursery on wheels. But despite Peugeot's promise, the build quality does leave room for improvement. The gear leaver feels sloppy. When leaning a knee on the centre console the whole thing moves, which doesn't give the feeling this is a very solid car. The 5008 is fitted with "head-up display". This is so pleasant to drive with that this feature alone is reason enough to prefer the 5008 over other cars! The speedometer is projected onto the windshield, so that the driver can keep his/her eyes on the road at all times. Next to the speed, the distance from the car in front is shown. When this distance reaches a dangerous level, a warning is shown. These same electronics are also used to determine if the car will fit in a parking space. The satnav is remarkable too. It doesn't just tilt the map so it looks like a 3D image, but it will actually curve a map to display mountains. When nearing an exit, the sign showing the name of a town is rendered in an almost photorealistic way. A last novelty of the satnav system is that it will warn about speed traps (only in countries where this is allowed). The audio system has an input for external devices and two (!) slots for SD memory cards. Regrettably it does not have a USB connector. To make the 5008 as safe and nimble as possible, Peugeot saved weight whereever possible. For example, the bonnet is made out of aluminium and the front wings are plastic. However, when compared to the specs of similar cars Peugeot managed to save just a few kilograms; the difference with its competitors is minimal. 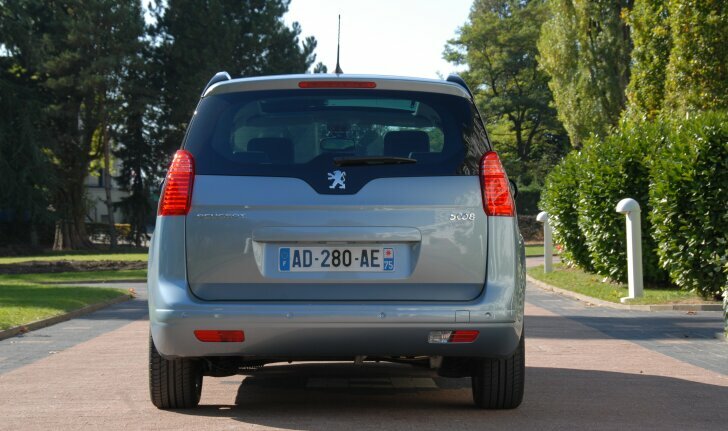 The suspension is based on the Citroën C4 Picasso, but has been altered by Peugeot. The result is that the 5008 isn't especially comfortable, like most French cars. 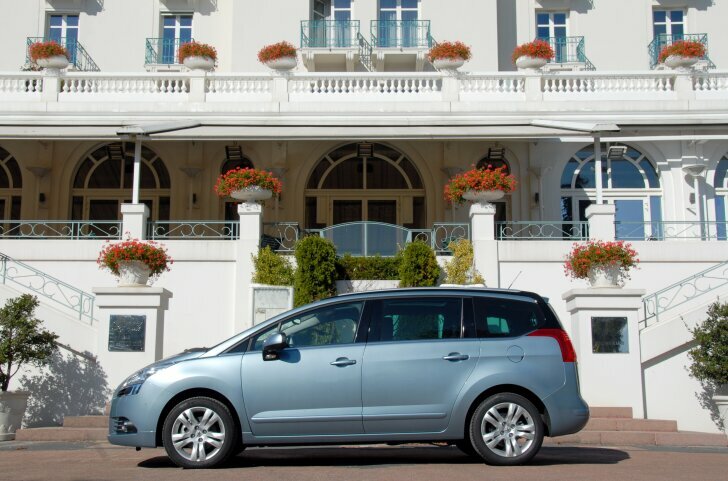 Instead the 5008 has a firm ride which makes handling very good, even with seven people or a lot of luggage on board. Steering is indirect, so the car doesn't lend itself for fast cornering. The rim size strongly influences driving quality. With 17 or 18 inch rims, the 5008 tilts less in the corner and steering is a bit more responsive. 16 inch rims in combination with Michelin tyres make the car more fuel efficient (4 grams of CO2 per kilometer and 0.2 litres of fuel per 100 km). When taking a test drive, do mind the tyre size on the test vehicle since this will determine the entire experience. When the 5008 first goes on sale two diesel and two petrol engines will be available. This test drive starts with the two litre diesel. The "2.0 HDiF" is a modern engine: it is strong (150 PS / 340 Nm) yet efficient. No matter what the rev counter says, the engine is always torquey making the 5008 diesel a very relaxed car to drive. This is also why the excess wind noise at high speed is so noticeable. It isn't the usual noise, but has the same frequency as a human voice. This is why the 5008 is very quiet when measured in decibels, but less quiet when experienced by actual occupants. The 1.6 litre turbo petrol engine (156 PS / 240 Nm) has a remarkable character. The "THP" (turbo high pressure) is torque strong at unusual low revs. Only at high revs the engine will also be vivid. Because the power is available at such an early moment, Peugeot fits a shift indicator as standard. This shows the best moment to change gears. The "1.6 THP" is so strong that the shift indicator suggests to shift up at unlikely moments. This does require some getting used to, but eventually the turbo engine is recommendable. When driving calmly, this petrol engine is strong like a diesel. Now the engine is quiet and very fuel efficient. Only when provoked does the turbo engine make this large family car quick and even a bit sporty. Still both performance and efficiency aren't much better than those of other cars in this segment. It is the ambience in the interior, the special character of the engine and the modern equipment that give the 5008 a unique personality. Peugeot tried to build a car that offers the space of an MPV, but with the looks and refinement of a normal car. With the 5008 the French car maker succeeds in doing so, but the differences are in the details. Basically the 5008 is just another large, boxy car where every cubic centimetre has been put to use. The design does give the 5008 a bit more flair than usual. From a technical point of view the 5008 also differs from its rivals. Again Peugeot manages to give the 5008 the feel of like a normal car, not a van. Roadholding is excellent and the suspension performs well under heavy loads. The engines perform well and still use little fuel.